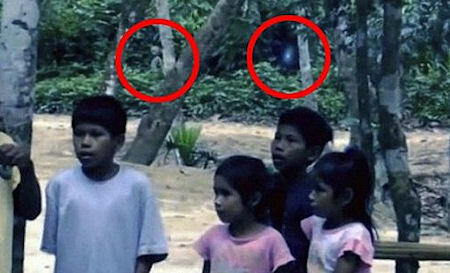 Uhhhhhhh….a picture, taken from video footage, which purportedly shows an alien lurking in the Amazon, shows an unidentified being standing with its back arched a few feet from a what looks like a floating orb of light behind a group of children. The video was taken by two British tourists visiting the Mamaus region of the Brazilian rainforest. This entry was posted in Strange, UFO, Video. Bookmark the permalink.